Norman Rockwell's The Runaway appeared on the cover of The Saturday Evening Post published September 20, 1958. This is a timeless favorite of Rockwell collectors, a true classic for the ages. This painting was Rockwell's 302nd overall out of 322 total paintings featured on the cover of the Saturday Evening Post. Rockwell's career with the Post spanned 47 years, from his first cover illustration, Boy With Baby Carriage in 1916 to his last, Portrait of John F. Kennedy, in 1963. This is also the fourth for The Post in 1958. In 1958, there were five Norman Rockwell Saturday Evening Post covers published. This was also the 302nd of 322 Rockwell paintings published on the cover of the Post. and on page 219 of Norman Rockwell, A Definitive Catalogue by Laurie Norton Moffatt. Studies of this painting also appeared in The Norman Rockwell Album on page 166 and in Norman Rockwell's People by Susan E. Meyer on page 204. A photograph used in painting this illustration is reproduced in Norman Rockwell: Behind the Camera by Ron Schick on page 189, as well as the painting itself appearing on page 188. I have seen pristine original copy of this cover still attached to the magazine sell for close to one hundred dollars on eBay. And to think it only cost fifteen cents originally! The original oil on canvas painting, 35.75 inches by 33.5 inches or 91 by 90 cm, and an oil on canvas study for the final version of the painting, 30 x 28 inches or 76 x 71 cm, are part of the collection of the Norman Rockwell Museum Stockbridge Massachusetts. 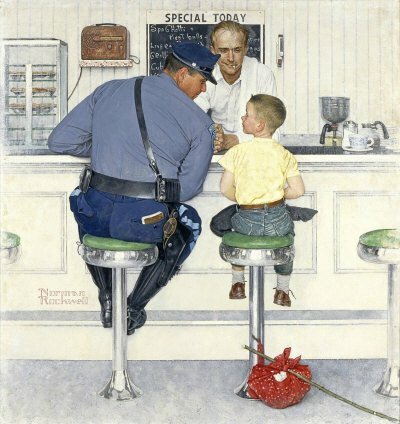 This classic Norman Rockwell painting depicts a policeman and alittle boy sharing the lunch counter at a diner. The diner is, I'm sure, a typical eatery from the 1950's. Some folks called these establishments "greasy spoons." This one is probably a cut above most since Rockwell painted it. The Howard Johnson's restaurant in Pittsfield, Massachusetts, was the actual setting for the painting. No details were overlooked by Rockwell: stools, counter-top, coffe pot, cup, sugar dispenser - even the radio mounted on its shelf on the wall. Television was very new when this was painted. Radio was how people stayed up on current events. The only character whose entire face we can see is the man in white behind the counter. He looks amused at the situation unfolding before him. Is the man in white also the cook? I hope not: he is smoking a cigarette. That would not be allowed today, but this was painted during the 1950's. Americans enjoyed a much greater degree of freedom in those simpler times. The largest character is, of course, the policeman. He is the blue uniformed authority figure in this painting. In addition to clothing part of his uniform, Rockwell spares no detail on his accessories. We see his pistol, his handcuff pouch and his citation book. I am unsure what the pouch attached to the shoulder strap is. 30-year-old Massachusetts State Trooper Richard J. Clemens, Rockwell's neighbor, was recruited to model for the part of the policeman. The cop looks less amused than the man in white. He is affecting a professional demeanor toward the situation. Sitting high off the floor on top of his green topped stool is the runaway himself. Is he engaged in a staring contest with the cop? He has apparently just left home. His clothes are still neatly tied inside his red bandana and fastened to his stick. The jeans and t-shirt he is wearing still look neat and fairly clean. He is not wearing his jacket; it is laying in his lap. 8-year-old Eddie Locke (the same model from Before the Shot) was picked to model the part of the runaway boy. He had been selected at the local elementary school. Did the boy bring money to buy lunch with? The man behind the counter has his hands clasped and seems to be waiting for an order. Spagetti and meatballs is the "SPECIAL TODAY." I'm sure the homemade pies in the display on the left are also delicious. In this illustration, Norman Rockwell treats us to three characters and their surroundings, the local diner. The Runaway was only one of 322 Norman Rockwell Saturday Evening Post covers; Here is the list of Norman Rockwell Saturday Evening Post cover illustrations. Will the policeman make the boy return home? Will he feed the boy first? And will the boy eat again just as soon as he walks in the door at home? Want to see one of the reference photo's for this painting? Check it out here.